We’re back from our 3 weeks vacation and the kids are bored. They miss our busy schedule back in the US. Temperature in Dubai ranges from 36C in the morning and 40C in the afternoon, so playing outdoor is not a good idea. 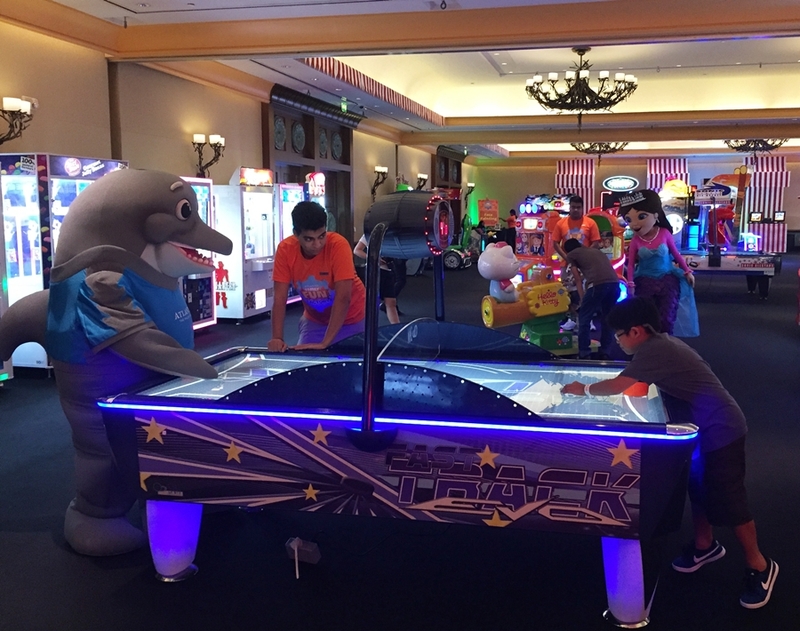 We were invited to have an afternoon of indoor fun at the Atlantis Fun Factory that offers an unlimited arcade games from 3pm to 10pm daily until August 23. For 75 dhs per child 16 years and younger includes 1 free adult entry for every purchase, the cost includes unlimited games and free face painting. They have games for everyone to enjoy. Daddy C spent a good 30 minutes playing the claw game and the likes but sadly did not get any prize from the machines. Just for the unlimited claw game access alone that would cost you between 5 to 10 dhs in the malls, the 75dhs is a GREAT DEAL! Children as young as 3 yrs can hop from 1 mini ride to another, face painting and make crafts for an additional cost. Some games give out tickets which you can collect in exchange for some stuff at the prize booth. Snacks and refreshments are also available to purchase at the Food Factory. It was difficult to get the kids to leave, we too had a hard time. Thank you for inviting us, Atlantis The Palm! Looks fun! Do you think a 3-year old would have lots of activities? The arcade looks ideal for 5 years and above yata. And in our case, 1 child 2 adults, we have to buy 2 tix? It was fun! My youngest is 3yrs and she had lot’s of fun, they have games like feed the dog, whack the head and rides. Yes, I think you would need to purchase 2 tickets for your family. Oh.. Ok thanks Abi. We’ll go this weekend. This looks like lot of fun. We are heading there this weekend and already so excited about it! Kids want to go back. Have fun!